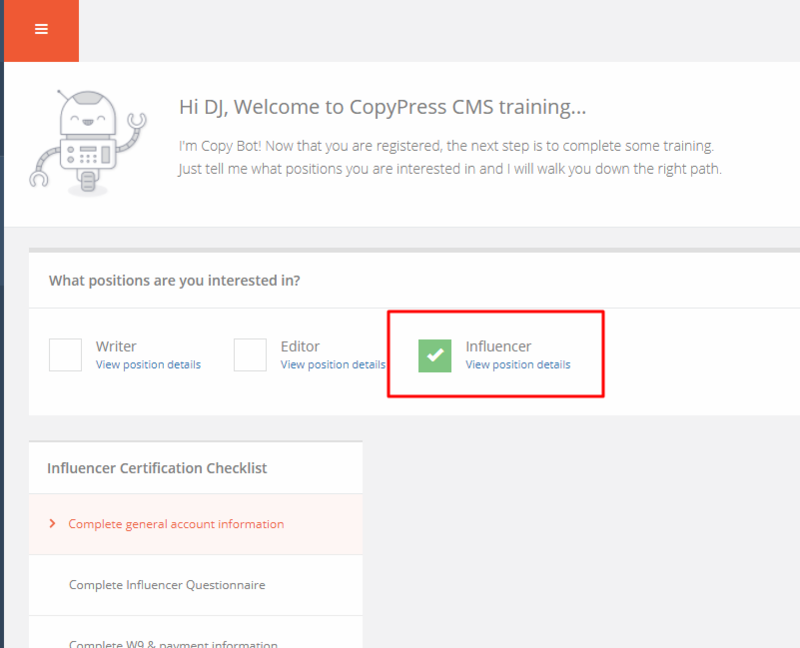 If you want to work as an Influencer for CopyPress, you’ll need to complete the onboarding steps found in the Training Checklist section of our CMS. The first step after you register will be to verify your email. You will have a notification bar on your training page until you verify. Simply go to your email and click the verify email link to have that notification removed. If you want to pursue the influencer position, simply select the box to the left of “Influencer” inside your training dashboard. The other fields are optional but are highly recommended. Please take a second to add an Avatar Image to your account so that our project managers can better identify you. Once you complete your general account information, you will then be asked to complete an influencer questionnaire. We want to know what languages you can write fluently in and if you’ve ever worked as an influencer for CopyPress in the past. We also ask you for your website details. 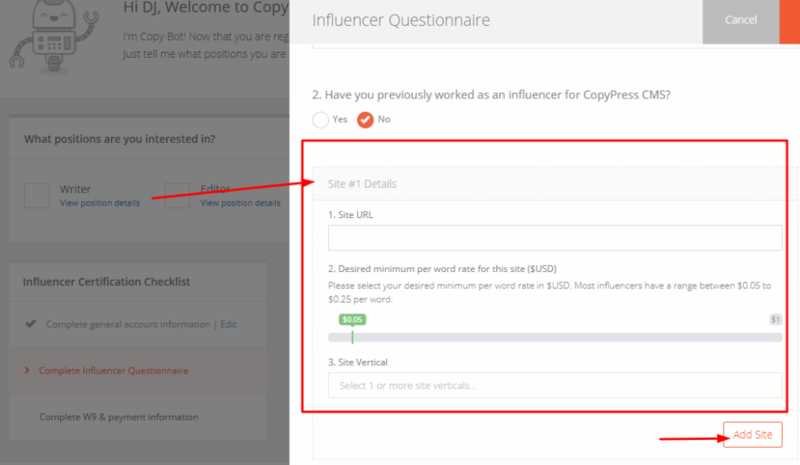 Right now, the CopyPress Influencer program is focused on bloggers who are willing to write and publish on their blog or another website they write on. We want to know the URL of your blog or another website that you have editorial rights on. The format of the URL should include http:// or https:// before. For example, https://copypress.com. This is your targeted per word rate to write and publish a client-friendly article on your blog or another website. While we try to only send you projects that meet your minimum word rate, we may send you other offers that are based on your vertical. You'll always have the ability to accept or deny an influencer assignment. We want to know what topics you feel comfortable writing and publishing on your blog or another website. You can select one or more verticals. If you have multiple blogs or additional sites that you are willing to write and publish client content on, then you can add those by clicking the "Add Site" button. You'll be able to add price and vertical to each site you enter into the questionnaire. Once you complete the influencer questionnaire, the last step is to complete your W9 information and payment details. To eliminate any tax fraud or payment errors, we ask you to please double check all your payment and W9 information before you submit. If you have an LLC or business EIN that you want to be paid through, please input that information in this section. Once you complete your influencer onboarding, you will enter a trial period until you complete five approved assignments. You may lose your influencer eligibility anytime during the trial period if you fail to meet our requirements.